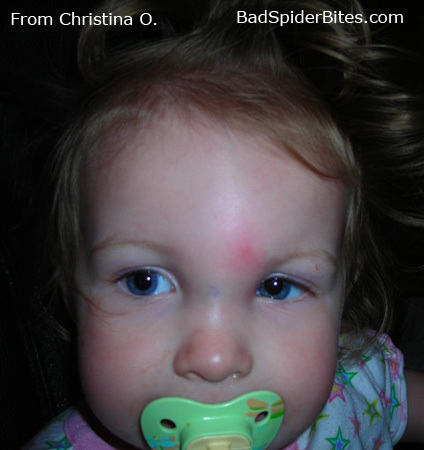 There are over 600 pictures of spider bites you can view and that is just the tip of the iceberg! Each one was submitted by someone bitten with some being small while others are horrible! Unfortunately, some doctors may misdiagnose a bite and provide the wrong treatment, so it is EXTREMELY important that you take pictures and document everything that is said, and if, God forbid, should you suffer permanent damage (such as loss of a finger, eye, or limb), you’ll have everything you need to back up your case. For example, take a look at the damage from the bite on Allen’s finger in picture 3; that finger will never be normal again. How about the scar left from the bite on Brian’s face, or the gaping hole on Clarence’s thigh and the left side of Chris’ face! Let’s not even think about the photo of a massive bump on Gina’s forehead (imagine feeling that bump on your own head?!). Most bites are NOT poisonous! Most spider bites are not poisonous and many of the images shown are from a reaction and/or not acting soon enough. For example, in some of the photos you’ll see a red line extending from the bite area – this can be a sign of poison and you should seek medical attention rather than wait to see how long the line grows! The key here is to act fast! Submit your spider bite photo! Were you bitten and would like to share your picture or find out what may have bitten you? If so, upload your picture and we’ll have a look. We also have a lot of pictures of scary spiders you can look at. Note: Many of the pest control companies offer a bug guard that costs around $35 and is a great way to help prevent bites like this from happening to you!